Moringa has Vitamin A, Vitamin B1, Vitamin B2, Vitamin B3, Vitamin B6, Vitamin B7, Vitamin C, Vitamin D, Vitamin E and Vitamin K.
In addition to this, Moringa contains the following minerals: Calcium, Copper, Iron, Potassium, Magnesium and Zinc. Okay, let me tell you why it benefits your hair. You need Vitamin B especially B6, biotin and folic acid if you are dealing with hair loss. Vitamin E stimulates your scalp by increasing blood circulation. If you increase your blood circulation that means your body would have more nutrients to the hair follicles so that your hair can grow stronger and healthier. Last but not least, you need Vitamin to improve your scalp circulation. You can find all the nutrients that are needed for healthy hair in Moringa. Healthy hair improves the physical appearance to a great extent. Health problems or nutritional deficiencies can damage the hair and cause problems like dandruff, split ends and breakage. Hence, proper intake of vitamins and minerals is essential for maintaining healthy hair. Certain vitamins, minerals and amino acids are involved in the formation of keratin protein. 1. Moringa Oleifera has a high content of vitamin A, thus promoting hair growth and maintenance. Optimum delivery of oxygen and nutrients from the circulatory system to the hair follicle is vital for proper hair growth. Vitamin A plays an important role in the development of healthy cells and tissues in the body and reduction of hair loss. Deficiency of vitamin A can cause thickening of scalp, dry hair and dandruff. 2. 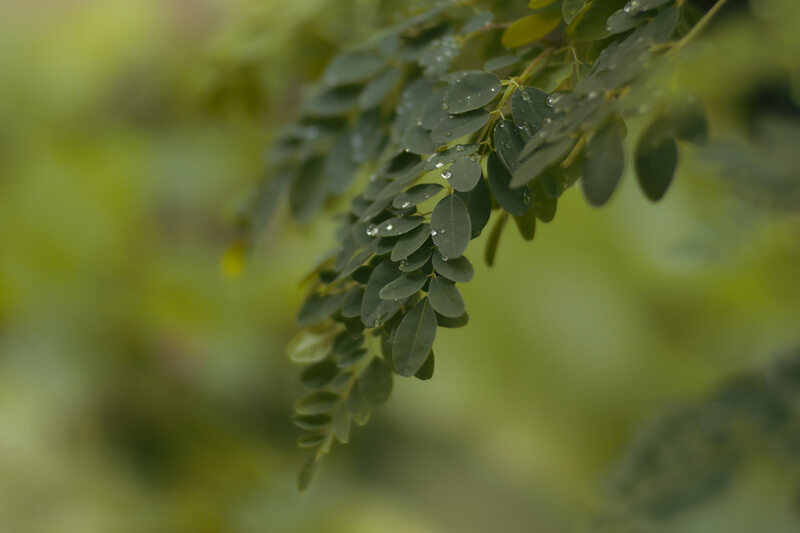 Moringa plant also contains zinc which stimulates hair growth by enhancing the immune function. Zinc and silica along with vitamin A prevents drying and clogging of the sebaceous glands. Sebaceous glands are responsible for production of sebum. Deficiency of zinc can lead to atrophy of the hair follicles due to the impairment of DNA and protein synthesis. Zinc also influences the conformation of nucleic acids. 3. Vitamin E in moringa is a powerful antioxidant that stimulates blood circulation around the scalp. Proper flow of blood to the scalp helps in the absorption of more nutrients available in the hair follicles. 4. Moringa is a storehouse of all the nutrients required for healthy hair. Hair loss occurs due to the deficiency of vitamin B- especially B6, biotin, inositol and folic acid. Proper blood circulation to the scalp enables hair follicles to grow stronger and healthier. Vitamin C together with vitamin E helps in the improvement of blood circulation in the scalp. It is vital to maintain capillaries that carry blood onto the follicles. 5. Moringa contains abundant quantities of minerals such as calcium, iron, potassium, magnesium, selenium, copper and manganese which are essential for healthy hair. 6. Moringa oil is a natural supplement for improving the health and strength of hair and scalp. Regular massage with this oil helps in reducing split ends and dandruff .It supplies rejuvenating vitamins and minerals to the hair follicles and tissues of the scalp. 7. Moringa is packed with amino acids, the building blocks of cells. There are a handful that are particularly important in hair growth—arginine, cystine, cysteine, lysine, methionine—all of which are abundant in moringa. Many people are lacking in the essential amino acids because of a poor or unvaried diet. A serving of moringa each morning, though, can give you exactly what you need! 8. Vitamins C & E are powerful antioxidants that help fight against damaging free radicals. Free radicals accost the body from both the inside and outside, causing hair to weaken and even turn grey. Vitamin C can help combat this damage while vitamin E can help repair the damage that is already done.